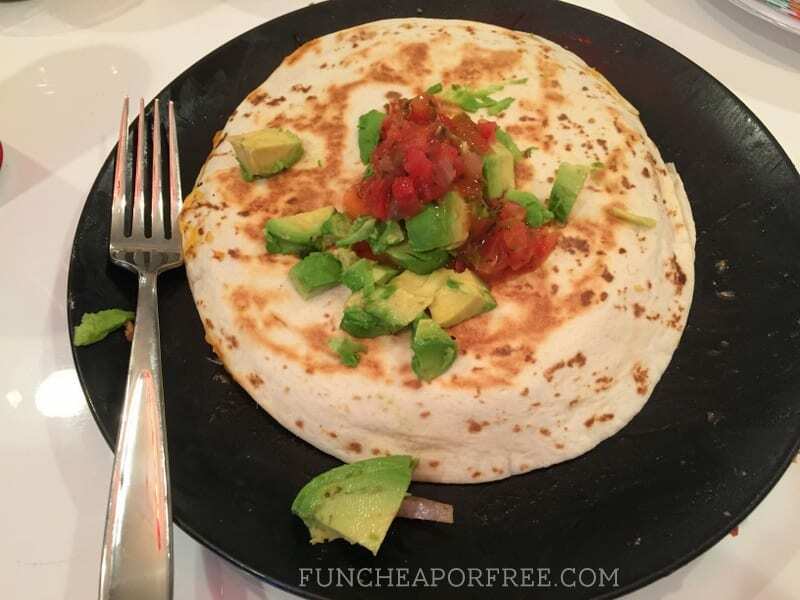 Welcome to PART 2 (of 3) of my Disneyland on the Cheap series! 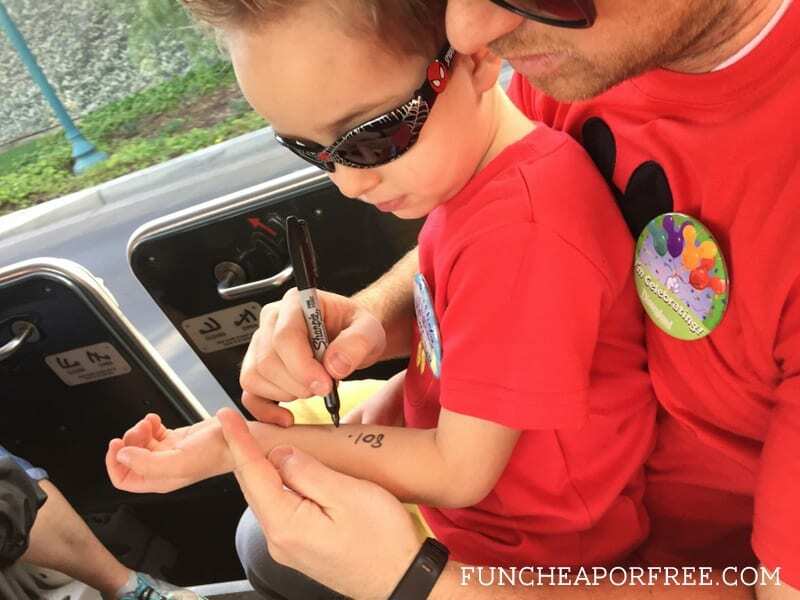 As you might know, we took our kids to Disneyland for the first time in February. I hadn’t been to Disneyland since I was a kid, and hardly remembered it. I was SO excited, but SO intimidated! What to pack? How much will it cost? Where to stay? Is it possible with a newborn? Can we afford it? Note: BE SURE TO READ PART 1 BEFORE PART 2! Trust me, it will answer TONS of questions you're bound to have. Part 1 covered what our trip cost, how to budget/afford/save up for it, where we stayed, and more. So again, don't skip it, mmmmkay? Part 3 covers will cover everything you need to know about life inside the parks. And I mean everythaaang. First, a slight disclaimer: I am a Disney newbie and don’t claim to be an expert by any means. However, many many hours of research, info from Disney experts, and personal experience made these posts. We went to Disneyland in Anaheim, CA so that’s what I’ll be covering. We have 4 children, ages to newborn 5 years old. Take these tips and make them adapt to YOUR family situation! Oh and no, this post isn’t sponsored by Disney – Disney doesn’t even know I exist, actually. Yeah, I’m kinda sad about it. WARNING: These posts are LONG and WORDY! But I hope the endless hours I put into it answers every question you could ever have. Wheew! That being said, let’s get on with it, shall we? 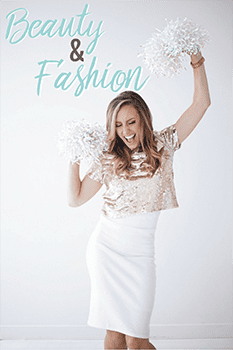 Psst – all my favorite products are linked to one page for easy finding, so check them all out for more info! Properly budget/save up for your trip. 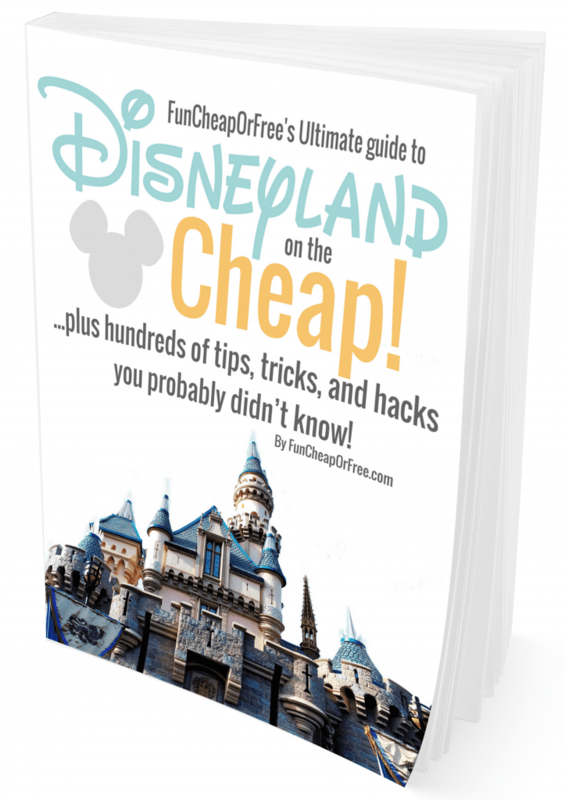 See all about that in PART 1 and pick up a copy of Disneyland On Any Budget for more money saving strategies before and during your trip. Book condo/hotel/rental car. The earlier you book, the better deal you'll find! Read my car rental tips before renting a car. See PART 1 for detail and a video showing where we stayed. We stayed in a 3 bedroom condo for just $169/night, a crazy steal. Go to SuiteEscapes.com, and ask for your special FCF readers discount (for new reservations only). Just tell them you heard about them from here and you're good to go! They also offer deals when booking 7 nights or more, just for you Freebs. Book flights. Again, the earlier, the better! See my cheapest times to fly post for tips on flights. Make matching shirts. As you see in the video above, my mom ordered us all matching shirts from Etsy. For details on pricing see PART 1. We made fun of them, but LOVED having them! It was easy to spot each other, and made for really fun pictures 🙂 But my vote is that matching shirts are a must. There are tons of different shops on Etsy, depending on what your price-point is. But note that if you get custom-made shirts like we did, it takes 6+ weeks sometimes so order early! For a more economical approach, find plain matching t-shirts from Target or Walmart, buy Iron transfer paper , and make some yourself! Start packing early. Use my printable packing list to help. I like to lay the suit cases out 1 week early and slowly add things throughout the week. Believe it or not, it helps cut back on over-packing dramatically! I also set out my favorite organization bin and fill it with odds and ends for the kids throughout the week. Note, this is an old picture – these weren't our actual suit cases for Disneyland. But you get the idea at least. Arrange pet sitter/house sitter. If you need one, figure it out early! Details on what we paid ours in PART 1. Get car serviced (if driving). Change oil in car, check tire pressure, get your car serviced, and change the tires if you need to. I also like to have mine cleaned so it's not nasty when I'm sitting in it for 11 hours straight. 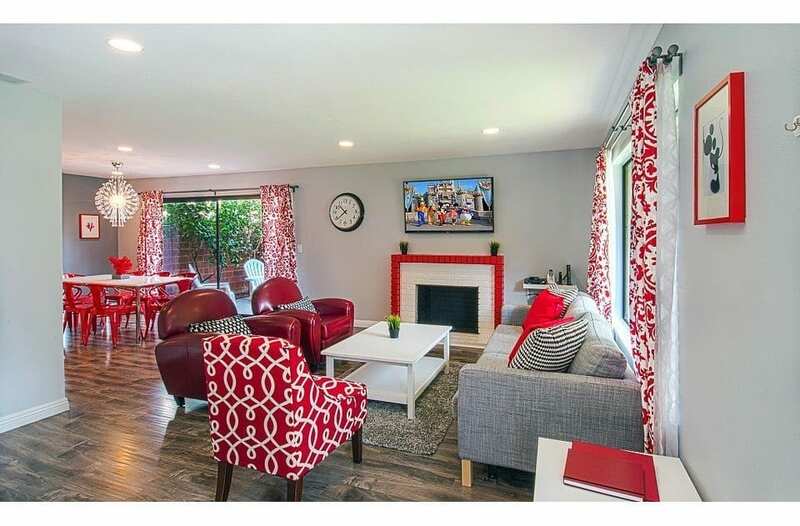 Schedule house cleaners. As explained in the last part of the video above, it's tradition to have house cleaners come while away on vacation. Let me tell you, I'll pack bag lunches for a week in order to afford them…it's the best part of my vacation! See what we pay our cleaners in PART 1. Download RideMax. It's $15, and worth EVERY PENNY. Don't download it too early, because you only get it for 90 days at the $15 price. I'll cover this in full detail in PART 3 but basically it's an app that allows you to put in all the rides, attractions, and shows you want to see, and it gives you an extremely detailed agenda to follow in order to hit the shortest lines. I don't know how they do it, but it's downright genius. Best $15 you'll spend on your whole trip. Download the ChatBooks app! It automatically prints your Instagram pictures into 60 page, 6×6 photo books for just $6. It's how I journal all of our vacations. It dates the pictures, prints the caption, everything. It's BOMB. 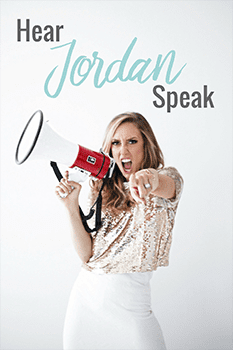 Read all about how I use it HERE, and use the code FUNCH145 to get your first book FREE! Check the weather to make sure you've packed appropriate clothing. Don't just assume it's going to be nice! It could be cold during certain times of year (especially at night), or blazing hot! Be prepared. Buy groceries, snacks, toys/prizes, souvenirs, and pack lunches BEFORE you go. See a list of food we like to pack below. Waterproof mascara (wet rides, long day, hot weather, all reasons to avoid raccoon eyes). Makeup setting powder or setting spray. It's a long day, don't want to look haggard by the end of the day right ladies?? 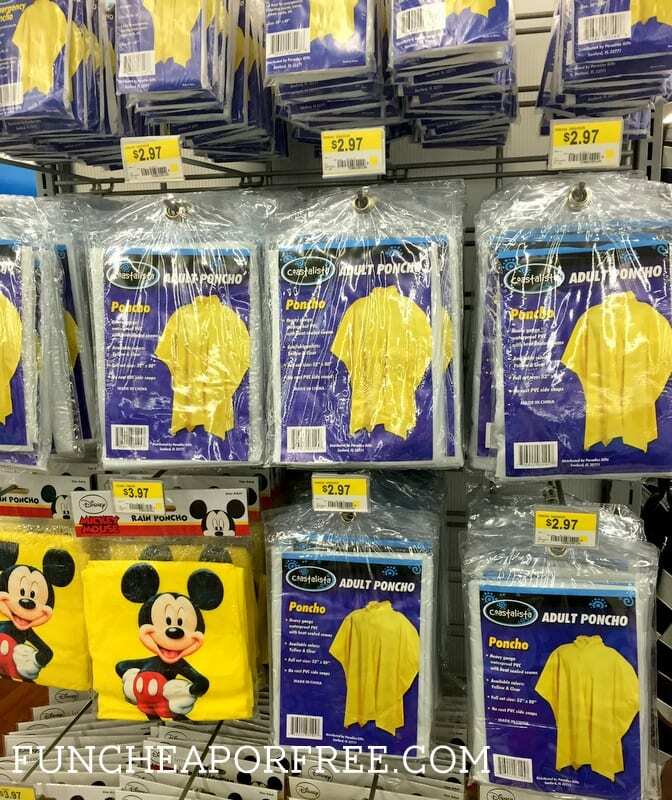 Gotta look good for Mickey, after all. My favorite is from NS Minerals. I have both the green tea setting powder and the setting spray, love them both. 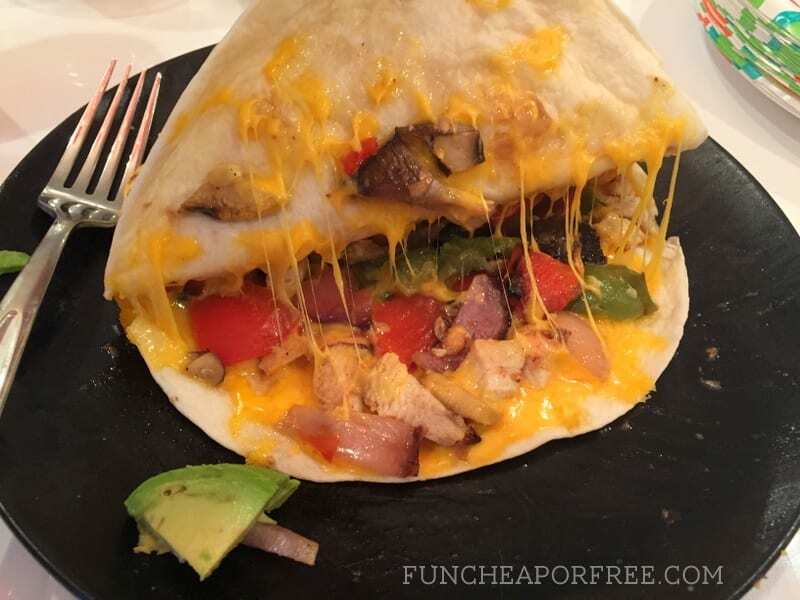 Use the code FUNCHEAP to get 10% off! 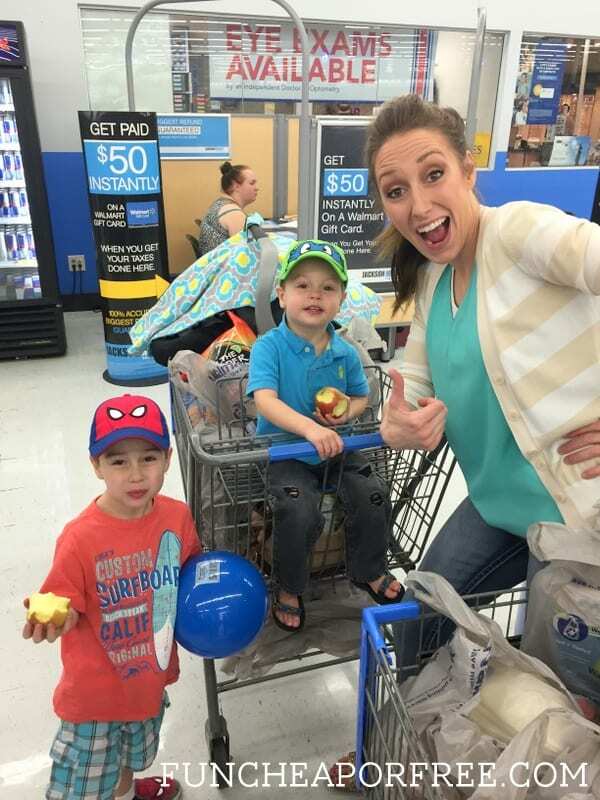 Double stroller…even if you only have 1 child! The extra seat is helpful when hauling massive amounts of STUFF and Disneyland does not have double strollers for rent. I absolutely love my Phil & Teds double stroller and will never own another stroller. I always leave the second seat on the stroller, even if only carrying one child because it holds so much stuff. Note: If you stay in the Suite Escapes condos like we did, they provide a single AND double stroller. We actually packed my double AND theirs into the park, and we used every square inch of both of them. Rain poncho . Not just for rain, you'll want it for any ride that gets you wet. Dollar store ones are no good. But one step up from (even $2.50) is good enough! We bought ours for a few bucks at the Walmart near Disneyland, shown in the video above. We actually never ended up using ours because the water rides were all closed. But hey, better safe than sorry! Sharpie . We used it several times – writing names on water bottles and matching souvenirs, writing names on our buttons (see PART 3 for all about these magical buttons), and writing our phone number on our kids in case they got lost. Sunscreen. We happen to really like sunscreen sticks because they don't leak in your bag and are small and easy to carry around. Mini backpack or fanny pack. Not just for granny any more! 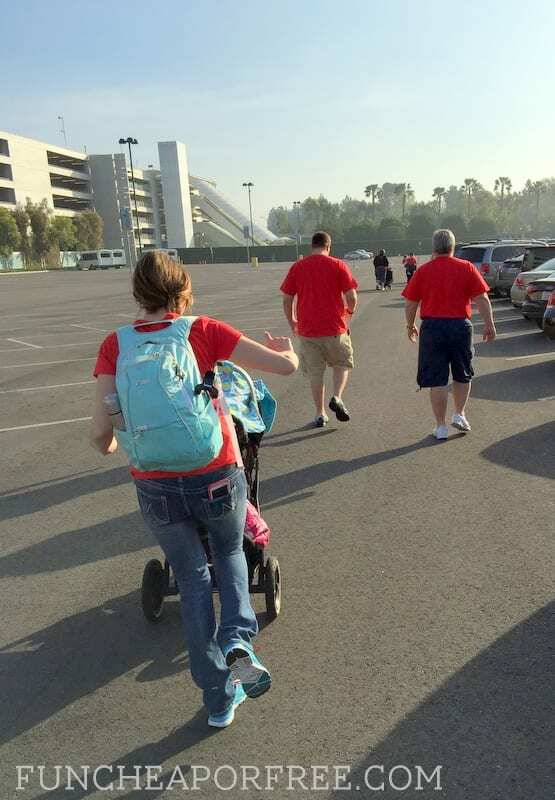 On the first day at Disneyland I brought a full-sized backpack. It was bulky and a nightmare on rides. The next day I brought my mini backpack and it was 1000x better, and held everything I needed. Unfortunately I couldn't find a picture of my mini backpack, but there are tons to choose from and I'm sure you can't go wrong. 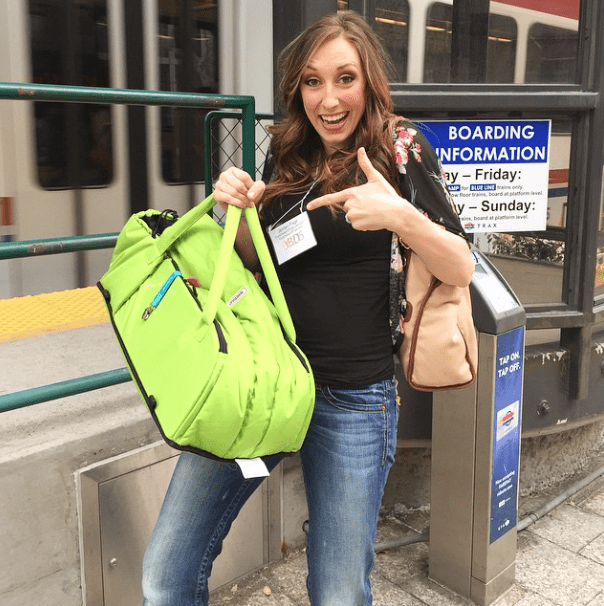 I brought this full-sized backpack the first day and it was way too bulky! Swimsuit. Whether you stay at a condo or hotel, they're bound to have a pool. And hello, the beach! Must go to the beach! 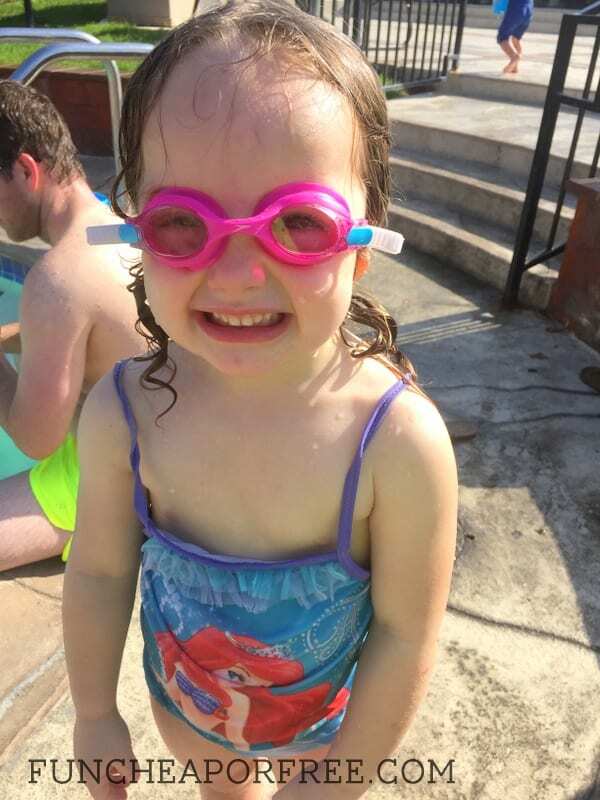 We also bought a 3-pack of children's goggles from Costco which came in handy. 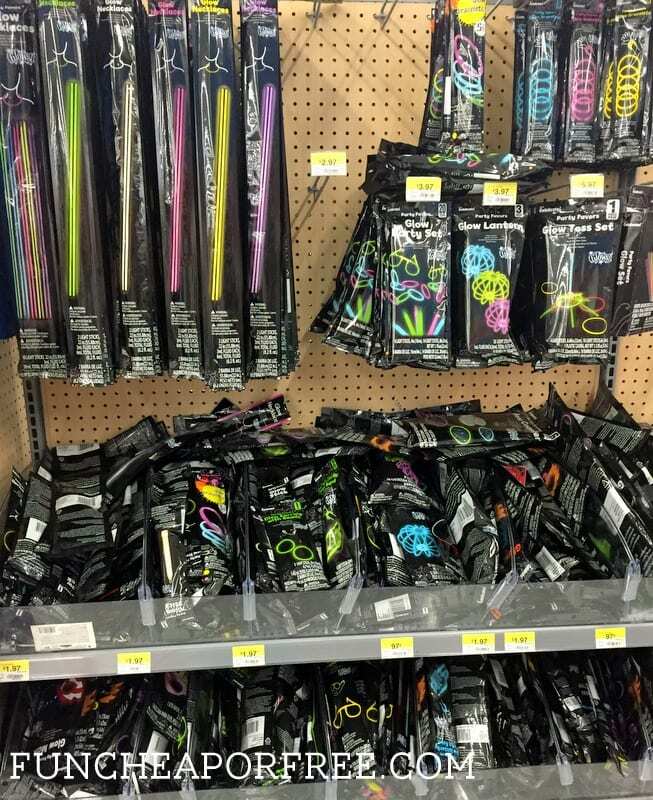 Glow sticks. 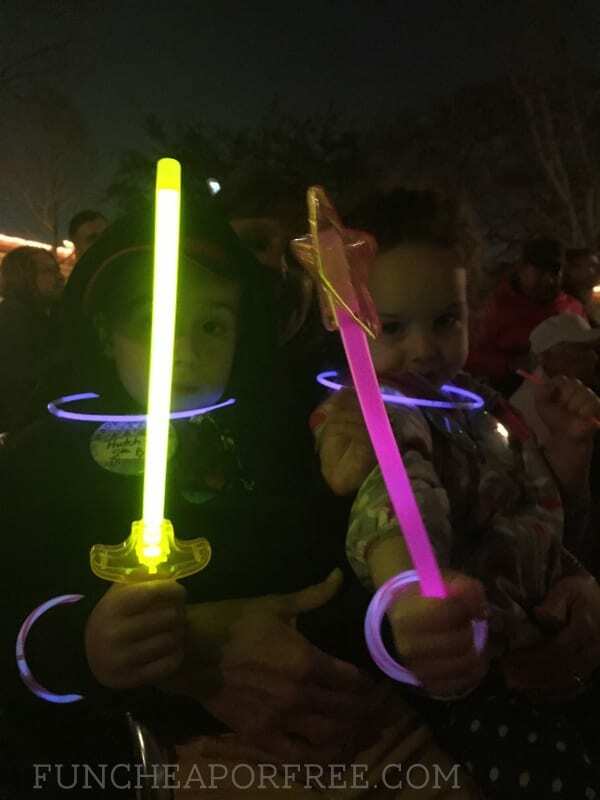 These are a MUST at night at Disneyland! Don't get stuck paying $6+ a pop in the park, though. Go to the nearest dollar store! They have racks and racks of swords, wands, rings, and 5+ packs of bracelets and necklaces for just $1. I failed to take a picture, but found Walmart to also have a huge selection and snapped a pic for you. Your own souvenirs. 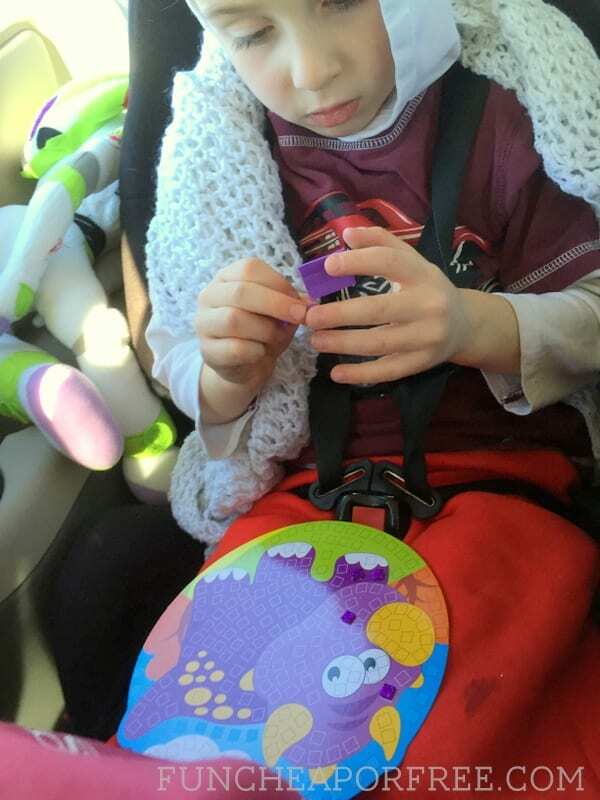 While we did allow each of our kids to pick 1 souvenir each from INSIDE the park (more about that in PART 3, see what it cost in PART 1), I recommend stocking up on cheaper items OUTSIDE the park. It's Disneyland! Allow yourself to get in the Disney spirit and come home with some useless junk – er, I mean, meaningful treasures. 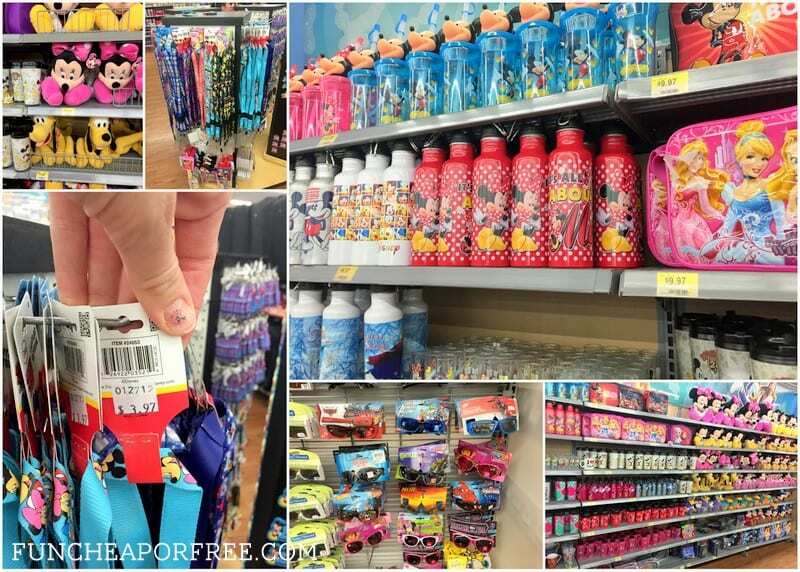 But just go to the Dollar store (they have TONS of Disney stuff), or go to the Target or Walmart that is closest to Disneyland to get legit Disney paraphernalia (as shown in the video above). Buy it before your trip, hide it from the kiddos, and have it magically appear throughout your trip. We used it as bribery, I mean incentives for good behavior for our kids. I bought a boat-load of Disney Dollar Store stuff and randomly handed it out during the day when kids were behaving well. They ended up losing or breaking 90% of it before our trip was over so I'm glad I didn't spend more than $1 on them. Travel-friendly outdoor toys for the kids (balls/gloves, skateboard or scooters, small bikes, sidewalk chalk, bubbles, etc.) – Gotta burn off energy after being cooped up inside! 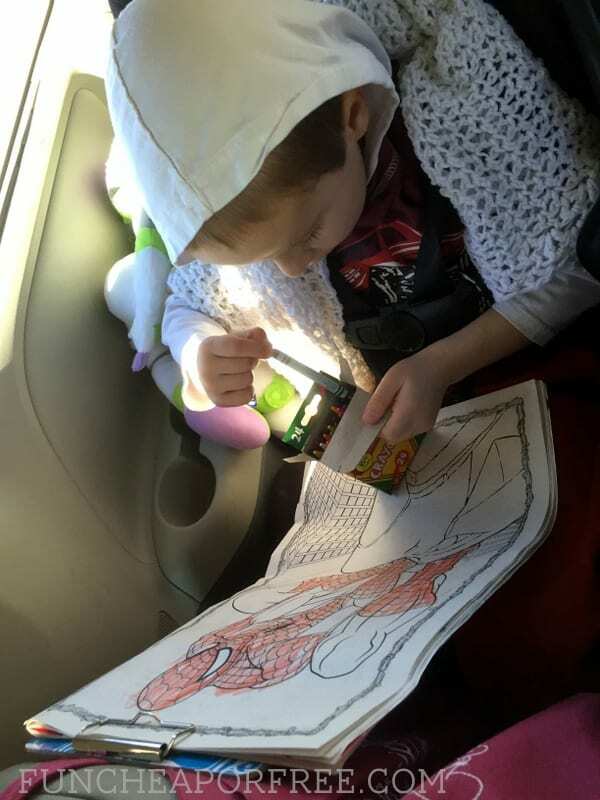 Travel-friendly indoor activities for kids (coloring, toys, movies). 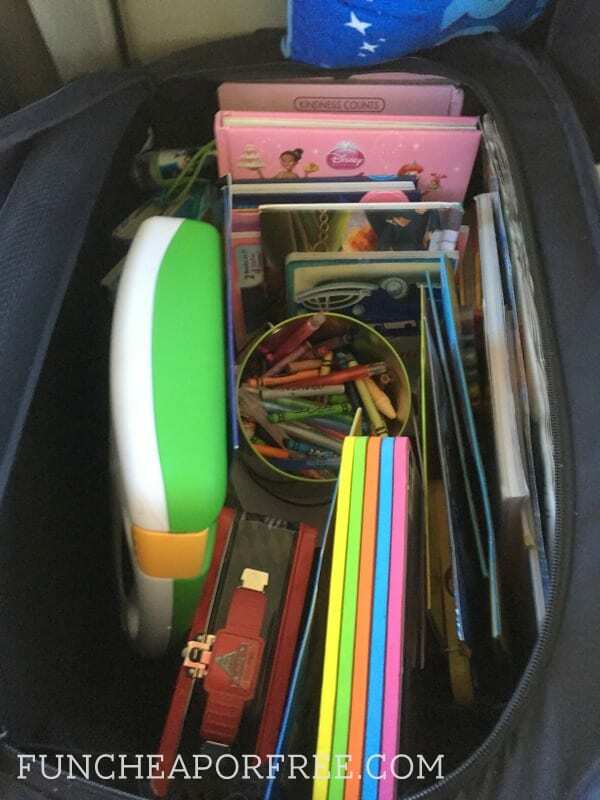 I filled this organization hamper with books, toys, crayons, stickers, etc. We had it in the car between the kids, and took it inside the condo with us so they had activities to do inside as well. Big camera. We packed our DSLR on the trip and didn't use it a single time. I even packed my small point-and-shoot, but same result. The only cameras we ended up using were the ones on our phones. My SIL used her DSLR quite a bit, but she doesn't have kids and that's basically all she packed around. 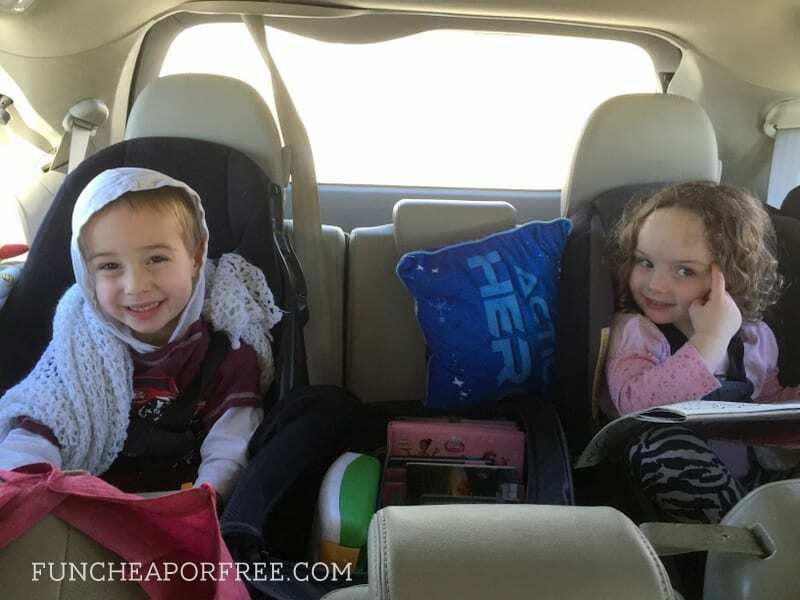 For anyone traveling with kids I would suggest leaving it behind since it's so clunky! Selfie stick. It was fun while it lasted. 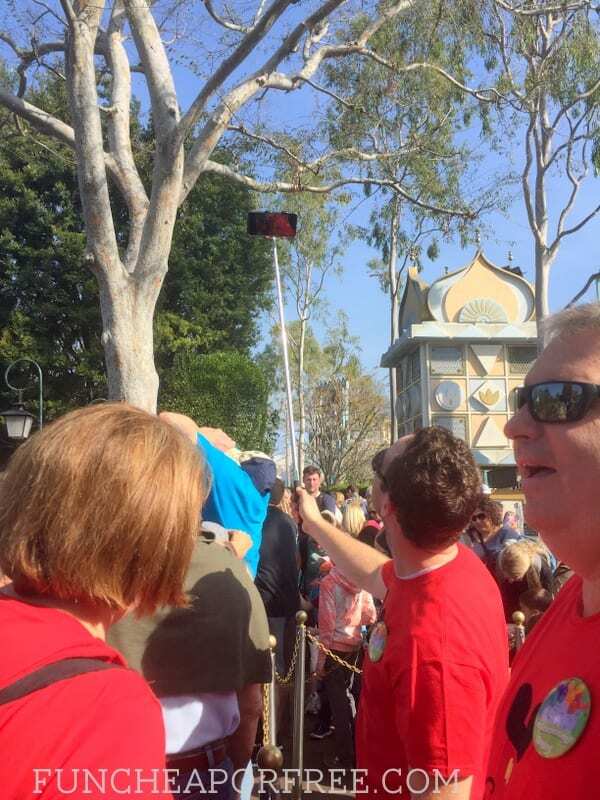 Selfie Sticks are now banned at the Disneyland Resort. You can't get past security with one of these babies anymore. Don't worry, any Disney photographer will take a picture of your entire group for free. Just hand them your cell phone or camera and it's yours to keep forever. Diaper bag/purse. As mentioned above, I recommend a mini backpack or fanny pack. Leave the diaper bag, no matter how cute it is, at home! Flexible tub…bin…thing. 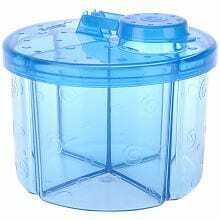 As mentioned in the video, I use a flexible tub like this one to keep all our food in. 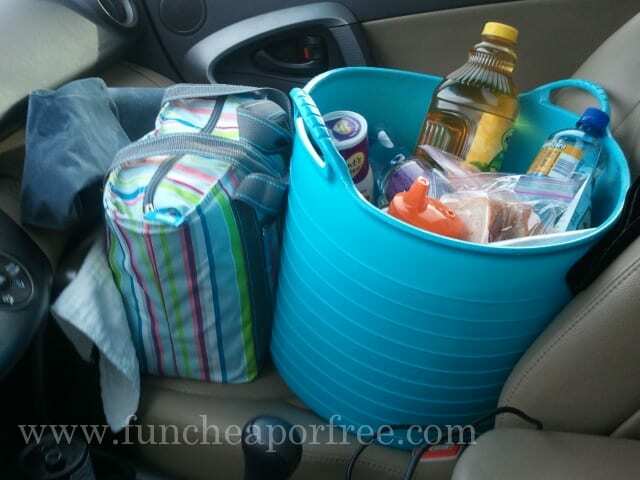 It's easy to haul in and out of the car and big enough to hold everything you need. The fact that it's flexible allowed us to squeeze it in and conserve space. The handles are a major bonus! Car Vacuum . As shown in the video, I like to use it at each rest stop to stay on top of the crumbs and nastiness. Cooler bag. We used a large cooler bag like this one (that we got from Costco a while back) or you can use a small one like the striped bag pictured below. Either way, you'll need one for food that needs to stay cold. Paper plates, napkins, plastic forks & knives, small dixie cups. We heat up food on the go! Almost every gas station will have a microwave so those paper goods come in handy. 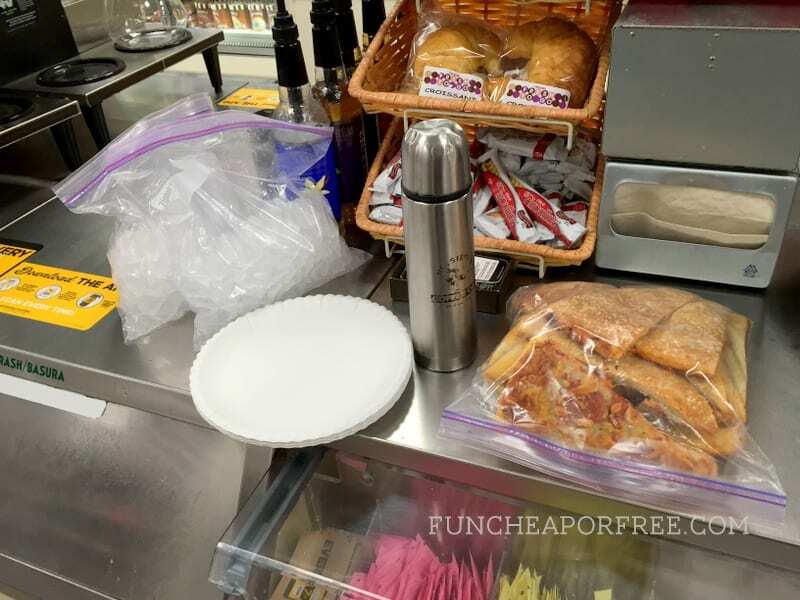 I also adore using paper hot dog trays (shown here), but Costco doesn't carry them in the winter and I ran out before our trip. The dixie cups come in handy when passing crackers, trail mix, or other small snack-y items to the kids. Pull-ups! Even on our potty trained kids. When kids need to go, the have to go ASAP. I'll just have them go in the pull-up when in an emergency situation, and toss it at the next stop. Cuts down on stops! Collapsable organization hamper. Seriously, can you tell how obsessed I am with this? It really is the best. 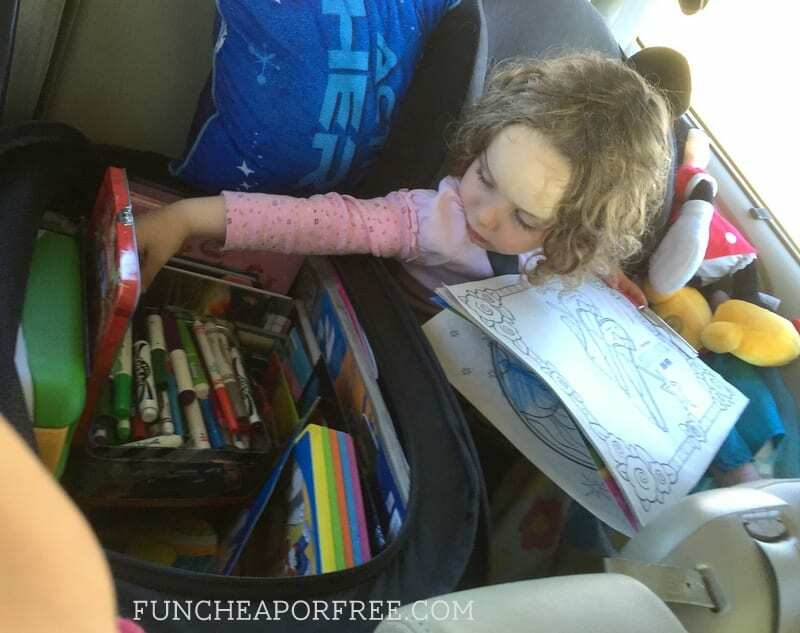 It slides perfectly between my kids' seats in the back, we fill it full of entertainment, snacks, etc. and then can carry it in and out of the car with us when we're spending the day at the condo or wherever. See a detailed picture above of what we put inside it. iPad headrest mount . We don't have a DVD player in our van, but it poses no problem because we have this baby! 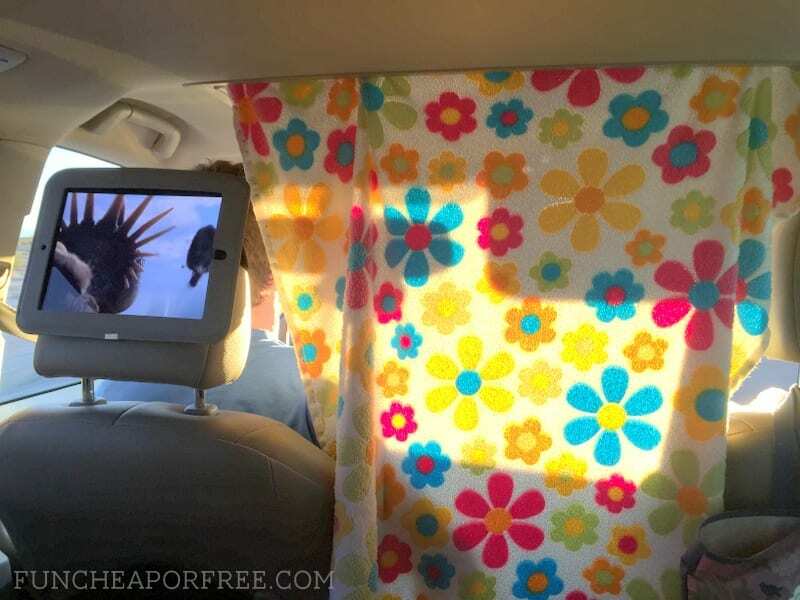 We strap it to the driver's headrest, and all the kids can see it from where they sit (as shown in the video above). We bought discounted iTunes gift cards from Costco and filled the iPads up with new movies. The blanket was put up for a few minutes as the sun was setting because it was blinding all of us. I know, I know, don't give me a hard time about the visibility, yadda, yadda. Dollar store/Target dollar bin activities and trinkets. No need to spend a lot on activities. 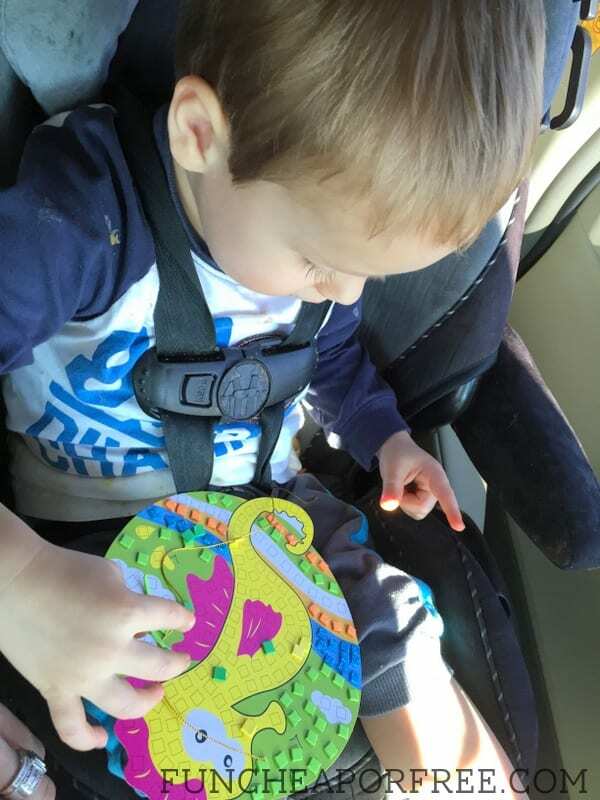 The Dollar store has plenty of goodies for little guys! 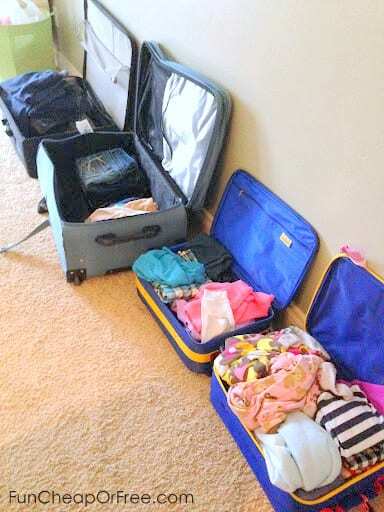 Again, see way more kid-friendly travel tips and tricks HERE. Sandwiches. 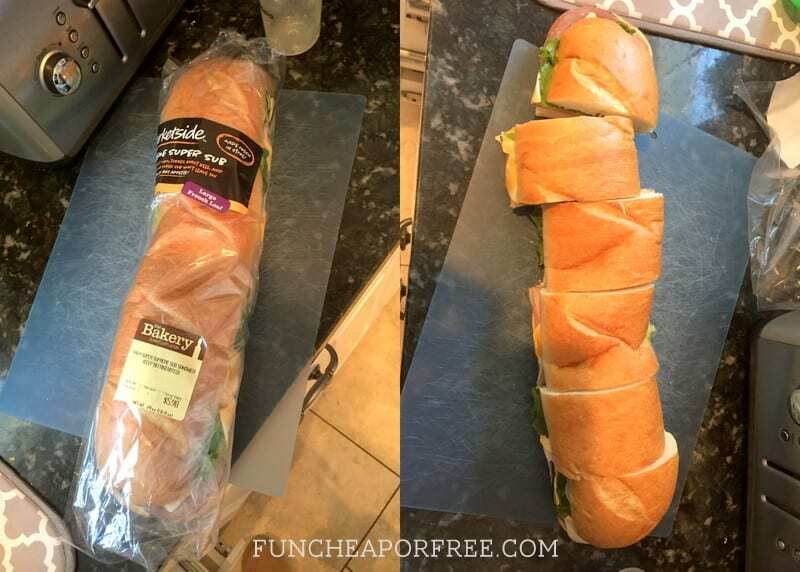 I bought a huge sub from Walmart for $6 and cut it up into smaller portions, bagged them in sandwich baggies, and we ate them all throughout the drive. Whenever we stop at gas stations I grab those little packets of mayo and mustard to add to the sandwiches. Adding condiments early makes for a soggy sandwich. 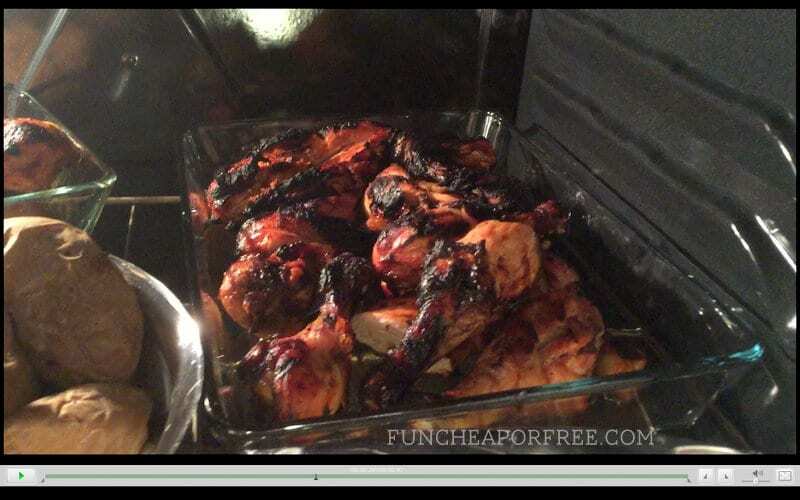 We used the grill provided at the condo to grill up chicken breasts and thighs after letting them marinate in BBQ sauce in a ziplock baggie. 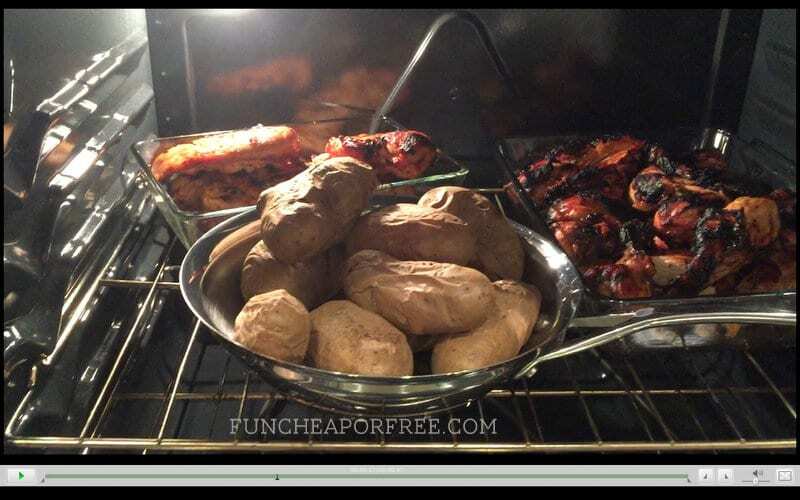 We baked some potatoes, then let them all sit in the oven to stay warm. 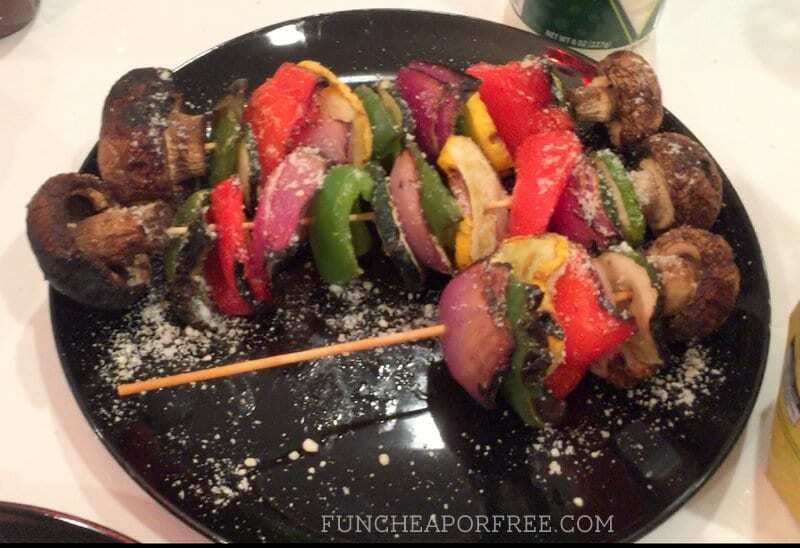 Made for a great dinner of loaded potatoes and grilled chicken & veggies! Baby hat. Protect your babe from that harsh sun! ERGObaby carrier. Really guys, don't spend your money on anything else. It's the best carrier around. 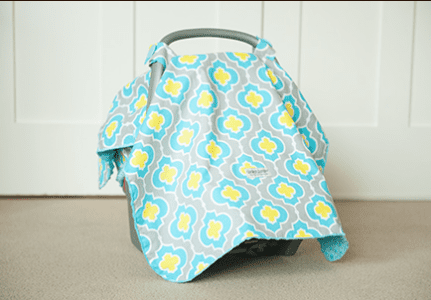 I love that it washes easily, takes up no space in a suitcase, and it grows with your baby because you can use it to hip carry AND piggy back-carry (even big kids!). I really want an Ergo 360 , because it allows you to legitimately have the baby forward facing (sure, so maybe I'm a rule breaker and have my baby facing forward in it once in a while. It's for like, 10 minutes at a time! She's fiiiiiine!). Maybe I'll sell some of my unused stuff to buy a 360 for the next baby (and no, that isn't an announcement!). 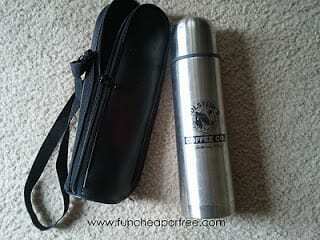 Travel thermos . My baby was 1/2 breast fed, 1/2 bottle fed at this time. Just fill the thermos with piping hot water in the morning, you've got hot water to last you all day. Perfect for filling bottles since it's actually pretty difficult to find warm (filtered) water at Disneyland, especially once your baby is already having a fit from hunger. Binky clip . Nothing worse than losing a binky to the nasty bathroom floor! Formula dispenser. 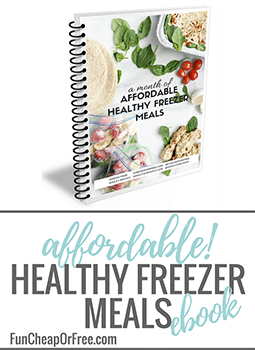 These are super inexpensive, and SUPER helpful! I carried a small container of formula with us in the bottom of the stroller so we'd have plenty to last all day, but always kept the dispenser filled and in my backpack. It was so much easier to use than scooping formula from the container, especially when in line for rides! Bottle brush . You'll need to clean out all those bottles somehow! 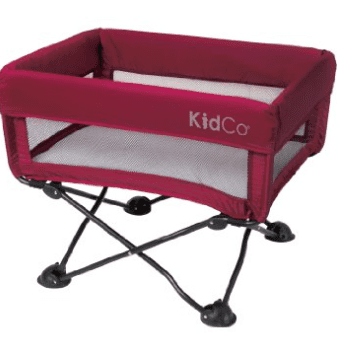 KidCo Dream Pod . Every time this pod is shown in the background of a picture or video on Instagram, my feed blows up about it!! It's the coolest thing, I'm surprised more people haven't heard of it. It's a travel crib that folds up small like a camping chair, but is big enough that Daivy (almost 5 months old now) is still using it. It's so much easier than a pack-n-play for a baby! They are pretty pricey, but I got mine off of Zulily for about $60 I believe. Carseat canopy. 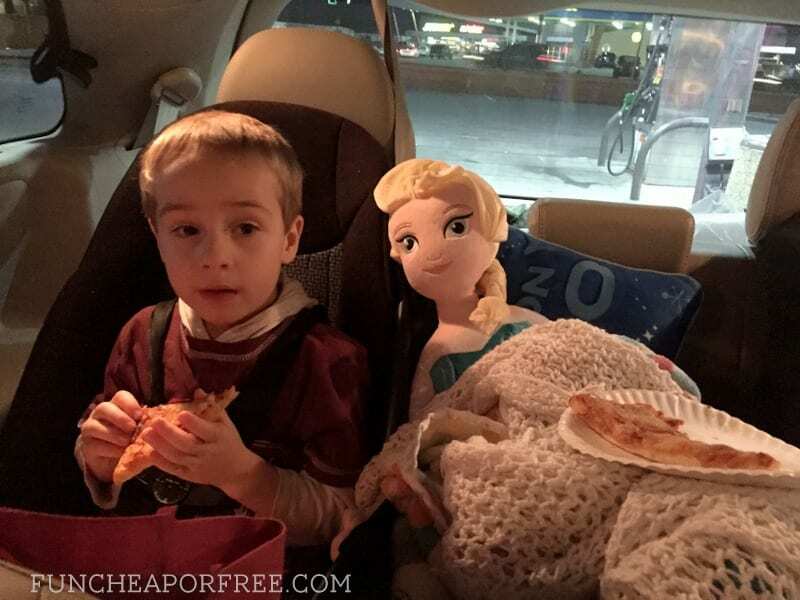 These are the BEST car seat covers. They are thick with Minky fabric on one side which makes it nice and heavy, so the wind doesn't blow it up easily. Also makes for a nice surface for changing diapers, and the occasional emergency blanket. GET ONE FREE with the code FREEBIE2014, just pay S&H! This amazing Cocoon from Phil & Teds. Again, every time I post a picture of this, my social media is inundated with questions about it. 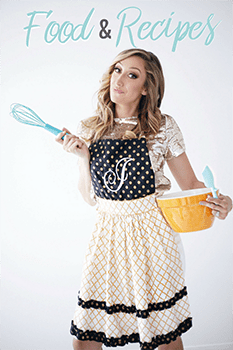 I'm here to give you the scoop! It's called a Cocoon. It's an attachment that goes with my (old) Phil & Ted's stroller. P&T is a jogging stroller, but newborns aren't sturdy enough to be buckled in. And I don't know about you, but I don't want to jog with my jumbo car seat in the stroller. They created this cocoon as a way to take your newborn jogging without breaking their necks – the seat reclines down and you slide the cocoon in the seat, and you run with them in a laying position. It's genius, really. I, as a matter of fact, hate jogging and never do it. But I bought the cocoon anyway and it's been the best money I've pretty much ever spent in my entire life of ever and ever. I use the cocoon when going to church, around the house, even put her in it at the daycare at the gym. She sleeps like, well, a baby in it, it's way easier to lug around than a car seat, and it's sturdy and keeps her safe from elements and siblings. 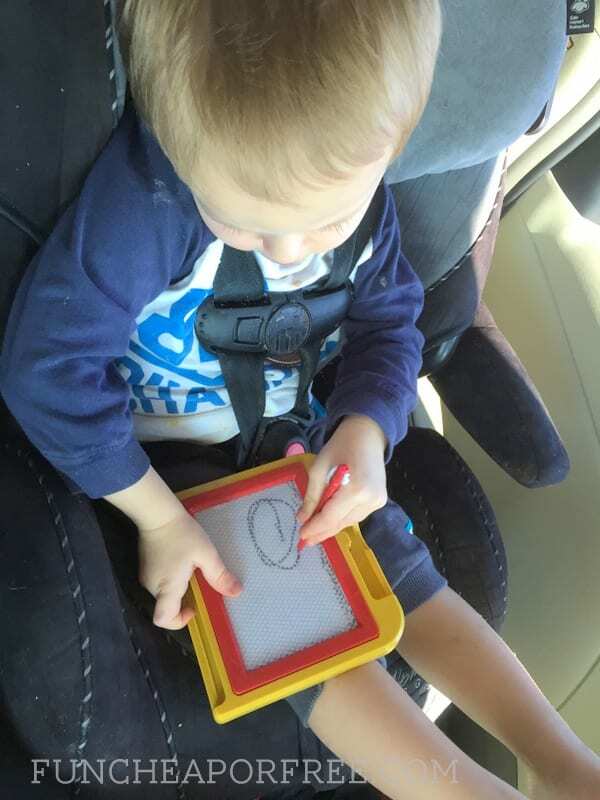 No, it doesn't replace a car seat. Think of it as a really well designed moses basket. Great question. We went back and forth on this. 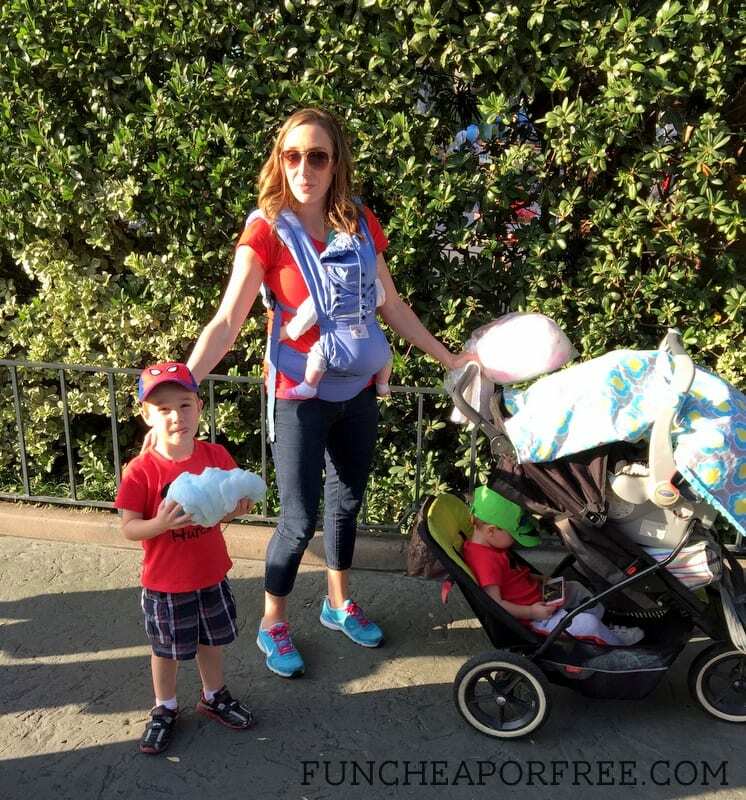 Ultimately we used a car seat for most of our time in the parks because we needed to be able to use the 2nd seat in my stroller (and we forgot to bring the attachment that would've made using both the cocoon and the 2nd seat possible). I knew I thought it wouldn't be prudent to keep her in the Ergo carrier the whole time…what if it's cold? Wet? Crowded and people are bumping into her? Don't we want to protect her from germs? etc. So we kept Daivy in the car seat the majority of the time, when I wasn't carrying her. It was obnoxious either way. 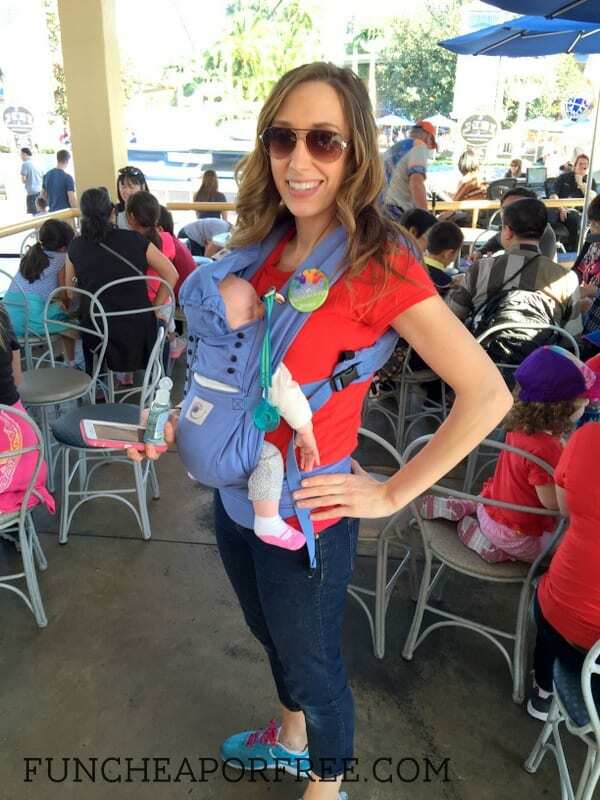 It was a lot of getting her in the car seat so she could sleep, then parking the stroller, unbuckling her, carrying her through the line or even onto a ride, or putting her in the ergo, then taking her out again…never figured out a great system. 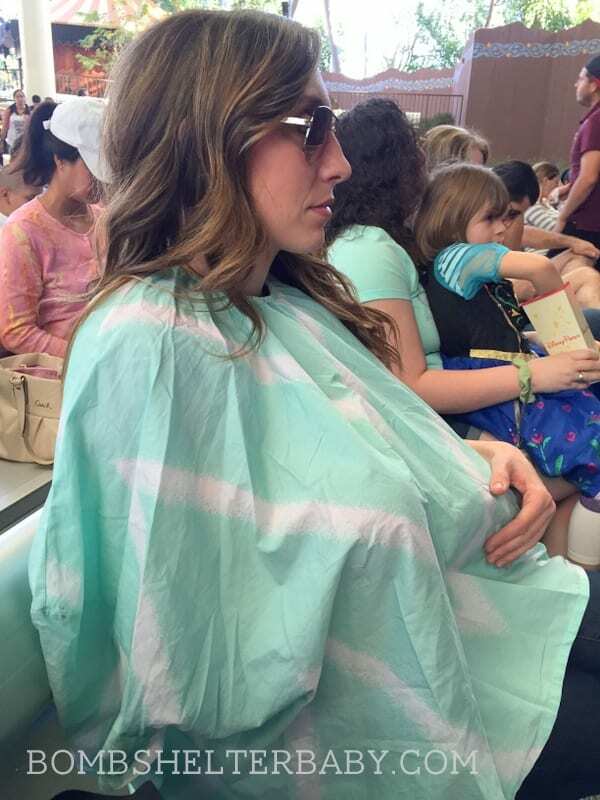 In Europe we had Daivy and only had the Cocoon and Ergo, and it was perfect. Maybe I'd do that next time. I guess if you held a gun to my head and told me to choose, I'd say take the car seat if they are 3 months or younger, skip the car seat and opt for a stroller and Ergo carrier (and maybe a cocoon) otherwise. WHEEW! I think that covers everything for PART 2. 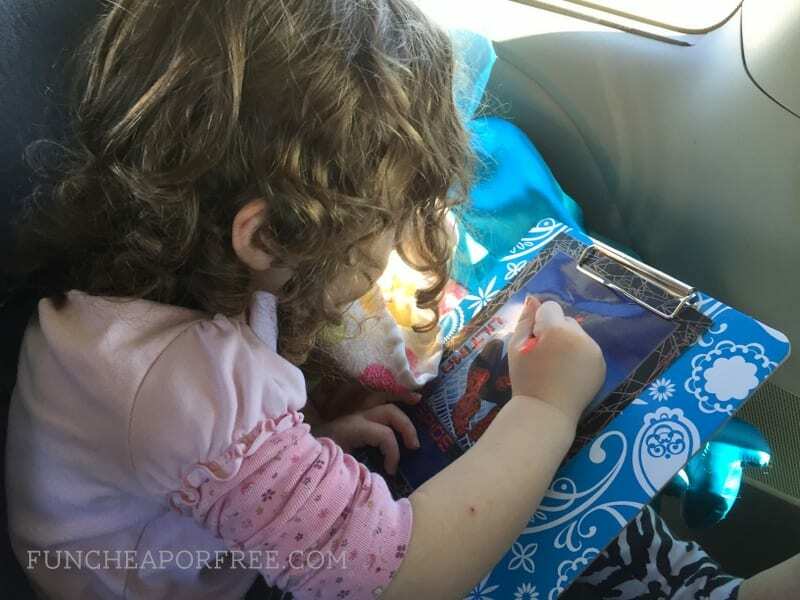 P.S – if you like this post, you'll love my How To Cruise With Kids post series, and my other travel posts too! 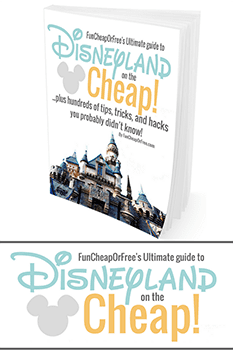 This post was updated by Jessica Sanders, author of Disneyland On Any Budget . Thanks for reading! Now, go rest your eyes a bit, eh? Love this post! I have read a ton of posts on Disney on pinterest and still learned a lot from yours. Love your blog. You should come to Charlotte, NC and do a seminar or something. We would love to have you! Wait a minute, wait a minute, wait a minute…….did I read that right? You can just use the microwaves to heat things up at gas stations?!?! That’s so cool! What a great tip! RIGHT?! Most of them have one! OK, so then do you ask them if you can use their microwave?!? 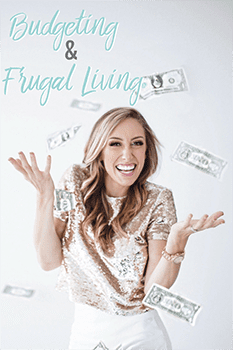 I mean this is a revolutionary idea that totally changes my usual travel game plan….! looooved this post as well, thanks! What I find really funny is the different stroller-systems in America and Europe: here in Europe, having the car-seat on the stroller is not seen that often while the cocoons are absolute standard. 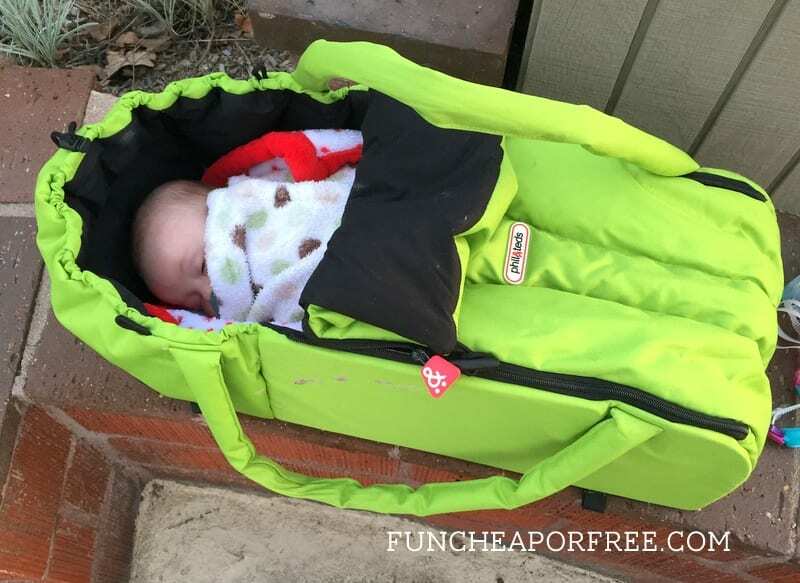 You have to explicitely ask if the car-seat can be mounted onto the stroller when buying it, while no-one will ever ask that question about the cocoon. Every child up to 6-9 months is in a cocoon, then the cocoon gets taken out and the child sits upright in the stroller. And: I LOVE the ergo-carrier as well! I used to carry our babies in a babysling and loved it. We got an ergo-carrier for my husband who wanted to carry the babies as well but didn’t want to fumble with the sling. I loooove it too and stole it quite often from him, haha! I really love all of this info………….thank you SO much. We will be taking our grandkids soon so this is perfect timing! Keep it coming!! Yeah…not sure what happened with that last comment above…? Anywhooo- super excited for part 3 to come out!! I wasn’t sure if you were covering if you had any issues with your kids wandering or if they stayed close by you. My kids can become quite the space cadets and can be difficult to keep track of (especially when they split off in two different directions). We will have lots of family with us, 8 kids, 8 and under. Wondering if you had any suggestions? You are AMAZING! You have such a gift for figuring out all of the best and most convenient ways to do things. Thank you for sharing all of your incredible tips! I’m not sure of you know this, but just a reminder that selfie sticks are actually prohibited at Disneyland.. Yes! That came into effect after our trip, thanks for the reminder! Selfie sticks are currently not allowed in the Disney theme parks. I can send you a picture of the sign if you like. I am loving reading through this series! We are Disney World veterans but hoping to take our first Disneyland trip in May. 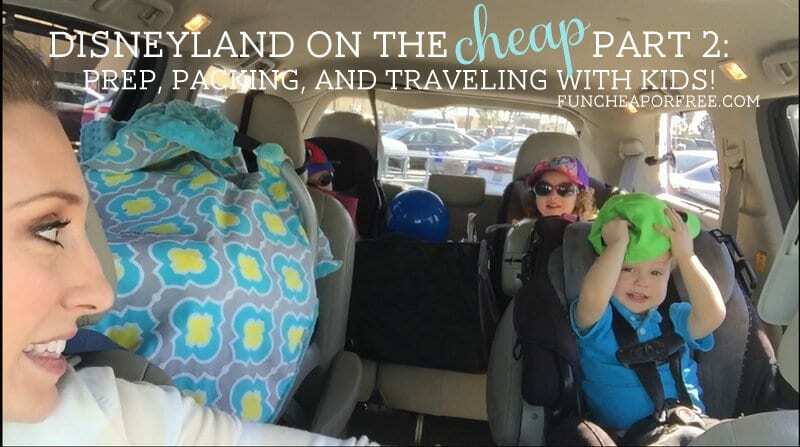 We don’t have any kids so obviously my trip will be quite different from yours, but I’m still finding lots of great travel tips! I almost WISH we were expecting because all of this baby stuff looks AWESOME! 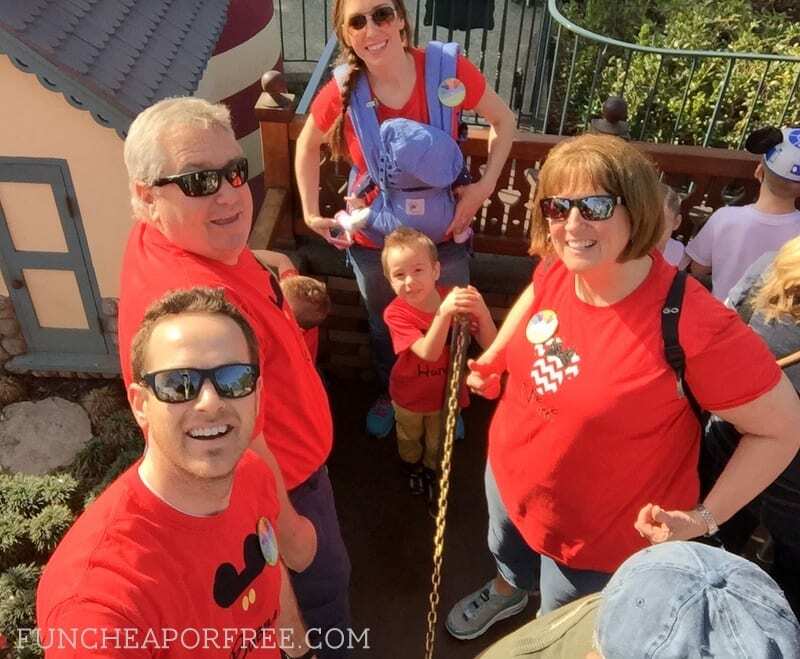 One quick note though- Disney has banned selfie sticks in the parks since you wrote this post. Do not bring one! They will confiscate it at the entrance and then you will have wasted $20 on it. Oh, and one more thing! 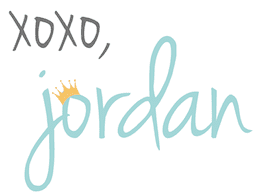 Have you heard of Thirty-One gifts? They create storage solutions, bags, purses, etc that are super cute. It is a direct sales industry. A lot of the gear you suggest having in the post are really similar to Thirty-One products. 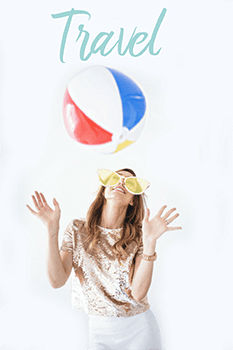 It can be spendy, but if you host a party you can save a LOT! I recently hosted a party and got 2 free purses valued at over $100 each, a free wallet, as well as about 4 items half-off! I only ended up spending about $125 and I got well over $600 worth of product. You should look into it! SO… I wish I would have read through all the comments before we came on our Disneyland trip! We took a selfie stick and we were so excited to use it. We had no idea that they were not allowed. As soon as we walked in with it we were hunted down by 2 not so nice Disney employees who told us our options were to hand it over and they would throw it away or we could go out and take it back to our car or room. So I left with it and headed back to the car- the employee followed me all the way out to make sure that I didn’t stash it somewhere?! You would have thought I was carrying a bomb!! I thought all Disney employees were nice but we got off to a really rough start. I was sad to have started our vacation on such a note. My kids were scared that they were not going to let me back in all because of a selfie stick!! She said that it is because people use them inside of rides. Well we were walking around I saw so many swords and double sided light sabers that would be way more damaging inside a ride than my little selfie stick!! Ok- rant over- thanks for listening! On a more positive note I loved all your advice and you really helped us plan for our trip! You might want to edit your post about the selfie stick in case more people like me don’t read through the comments?! No way!! yes I’ll edit that right now, wow, how things change so quickly! Thanks for the update! Do you know by chance what small snacks you can bring into Disney land? We are going next week? 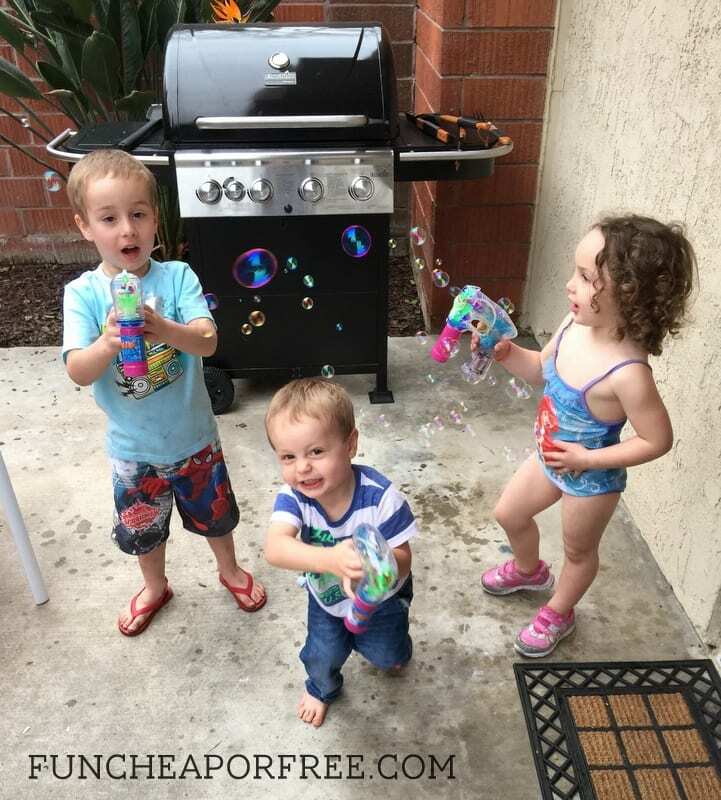 We have a one year old, 4 year old, 6 year old, and 9 year old. I’m wondering what small snacks we can bring and what their water bottle policy is? I believe you can bring anything as long as it’s not in a glass container, and doesn’t contain alcohol! I know this is from several years ago, but I just wanted to let you know that there is in fact a way to take bananas in the park! Yes, I made the same mistake taking a banana in my bag to Universal Studios once (it got smashed and then basically melted/caramelized in the Florida heat and got all over my bag before I knew what happened). So I researched how to fix that (because no day is complete without bananas, right?) and discovered banana keepers. They are plastic banana shaped containers that keep the bananas from getting squashed in your purse or backpack. I originally got mine on Amazon and paid a lot more than a piece of plastic should be worth, but recently I’ve been seeing them at the dollar store. They are awesome! Also if you’re in line, at a show, in the car, etc. and don’t have a way to easily throw away the peel (because the people around you don’t necessarily want to smell banana the rest of the time), you can put it in a ziploc bag to keep the smell away until you can get to the trash can. It also works for apple cores and orange peels. I am just wondering about the favorite organizational bin you refer to in this post. (under start packing early) If I click on the link, it takes me to a Costco shopping list. A new link would be great! This is the hard part. Love this post! SO helpful for our upcoming trip! Although we’ll be flying..with a 5 month old. Wish us luck! Such a great post & One Stop Mobility has double City Mini GT strollers for rent 🙂 ranging from $25-$55 based on the days.